Kitchen door blown out and damage to building and surrounding area. It’s not the first time the area has been targeted, but in previous attacks, the rockets have fallen in nearby open fields or into the sea. The residents of Acre, Nahariya, Shavei Tsion and other communities of the coastal Western Galilee know to take cover immediately on hearing the sirens. The IDF states that 4 rockets entered Israel but one was intercepted by the Iron Dome defense system. Another hit a street in Kibbutz Gesher haZiv. A road was damaged along with some vehicles. Two residents suffered from shock. 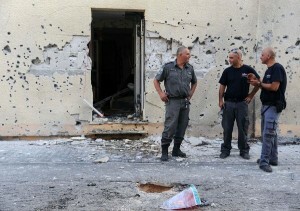 Minor damage was also caused by shrapnel from a rocket intercepted by the Iron Dome defense system. 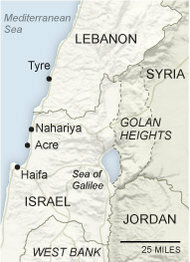 Lebanese sources reported that 2 additional rockets fell in open areas inside Lebanon. There have been conflicting reports about responsibility from Global Islamic Jihad to Palestinian groups claiming responsibility. The IDF does not blame Hizbollah, but Iran may still have been involved in directing the attacks. The prevailing message from the IDF is that it was the Palestinian affiliated groups and thus a ‘one-time’ event. However, those claiming responsibility (see below) are Sunni radicals and, if so, may be an off-shoot of Al Qaeda which might change the picture considerably. The US administration, of course, advised “restraint” by Israel while the State Department acknowledged that this was a breach of the “blue line” agreement between Lebanon and Israel. Both Israel and the US indicated that the government in Beirut is wholly responsible for keeping the peace. 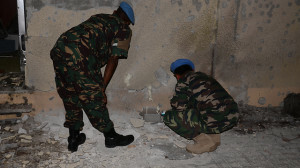 A UN spokesman noted that “UNIFIL is aware of the reports and the mission has sent one of its helicopters to investigate the incident. The force commander is also in contact with various parties and has called for restraint.” The Lebanese Army and UNIFIL are reported to be launching an investigation. The rocket, 122 mm in size, caused a large hole in front of the inn. Sheikh Siraj a-Din Zrikat, a Lebanese cleric affiliated with Sunni radicals, said Thursday that the “Abdallah al Aza’am Brigades and the Ziad al Jarah Squadrons” are responsible for the launch of four rockets at the direction of Israel.